Romania; also spelled: Rumania, is a country located at the crossroads of Central and Southeastern Europe, north of the Balkan Peninsula, on the Lower Danube, within and outside the Carpathian arch, bordering on the Black Sea. ExxonMobil Exploration and Production Romania Limited Nassau (Bahamas) is seeking for diving services using a remotely operated vehicle for a drilling programme in the Black Sea. The objective of the framework agreement is for ExxonMobil to be able to access the resources identified as necessary for the provision of services under the contract. Minimum and maximum operating 380 – 1,309 days of operation with mobilisation and demobilisation days are included in the tender. The project has a value between USD8 million and USD30 million with duration of 48 months. ExxonMobil is expecting the tenders to be submitted until November 06, 2012. Subsea World News – ExxonMobil Seeks ROV for Operations in Black Sea (Romania). ExxonMobil’s affiliate EMEPRL Corporation and OMV Petrom SA, the 51% subsidiary of OMV Aktiengesellschaft, today confirmed a potentially significant gas discovery in the Black Sea offshore Romania. Operated by ExxonMobil, the Domino-1 well is the first deep water exploration well offshore Romania and has a total depth of more than 3,000 meters below sea level. The Domino-1 well is located in the Neptun Block, 170 kilometers offshore in water approximately 930 meters deep. The exploration well encountered 70.7 meters of net gas pay, resulting in a preliminary estimate for the accumulation ranging from 1.5 to 3 trillion cubic feet (42 to 84 billion cubic meters). Drilling operations started at year-end 2011 and are in the process to be finalized. ExxonMobil and OMV Petrom plan new 3D seismic acquisition during 2012. The evaluation of the Domino-1 well results and the new seismic will determine next steps. Petrom’s report says that it is too early in the data evaluation and exploration process to determine whether the Neptun block will ultimately prove to be commercially developable or not. However, should further work confirm the technical and commercial feasibility of deep water gas production from the Neptun block, further investment during both the exploration and development phases could reach several billion USD with the potential for first production towards the end of the decade at the earliest. The drilling of Romania’s first deepwater well began last month. The well is being drilled by the world-class, sixth generation drillship, Deepwater Champion, which recently transited to Romanian waters after completing its drilling program offshore Turkey. 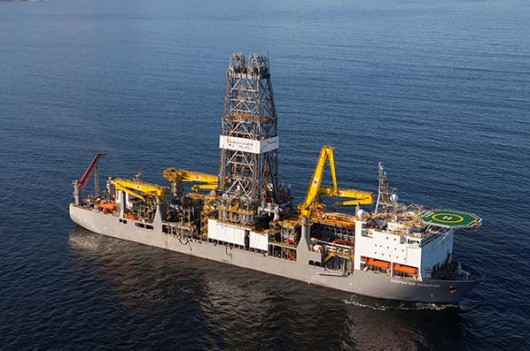 ExxonMobil Exploration and Production Romania and OMV Petrom, said on Friday that natural gas has been encountered in Domino‐1, the first deepwater exploration well in the Romanian sector of the Black Sea. “This is encouraging, but it is too early in the data evaluation and exploration process to speculate on whether it will prove to be commercial or not,” the two companies said in a statement. The Domino-1 well is located in the Neptun Block, 170 kilometers offshore in water about 1000 meters deep. Drilling operations started at year-end 2011 and are ongoing. The total depth of the well is expected to be more than 3000 metres below sea level. ExxonMobil’s Romanian subsidiary together with Petrom has started exploration drilling on Domino-1, the first deepwater exploration well in the Romanian sector of the Black Sea​. The Domino-1 well is located in the Neptun Block, 170 kilometers offshore in water about 1,000 meters deep and will be drilled using state-of-the-art industry technology. The well is being drilled by the world-class, sixth generation drillship, Deepwater Champion, which recently transited to Romanian waters after completing its drilling program offshore Turkey. Drilling operations are expected to take about 90 days. The drillship is owned by the world’s largest drilling contractor, Transocean. “We are very pleased to collaborate with Petrom in this project – a collaboration built upon ExxonMobil’s experience as a leader in deepwater exploration and Petrom’s vast experience in Romania. We highly value the efforts of the Romanian authorities for supporting the progress of the deepwater Black Sea exploration program,” said Ian A. Fischer, Managing Director of EEPRL. Exploration drilling, especially in such frontier, unexplored areas as the deepwater Black Sea, may or may not result in a discovery. If commercial discoveries are made, the development of the Neptun Block would yield significant positive industrial, social and economic benefits for Romania. “Together with our partner ExxonMobil, we are developing a unique project for Romania. Deepwater exploration carries high investment risks and requires investments of several hundred million U.S. dollars, yet a potential success would fundamentally change the perspective of the Romanian energy sector,” said Johann Pleininger, Petrom’s Executive Board Member responsible for Exploration & Production. 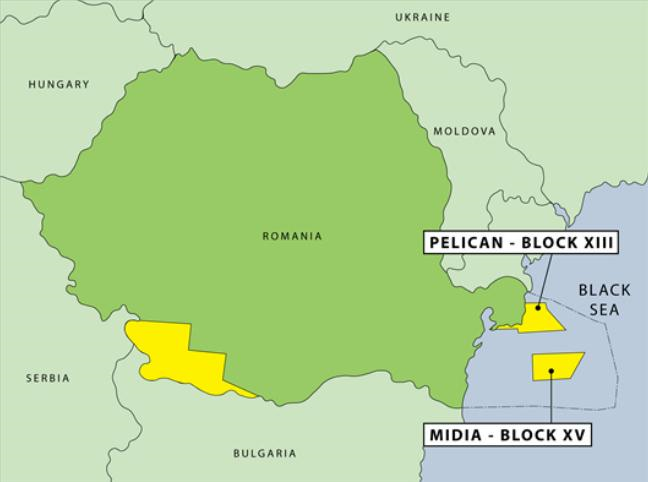 Sterling Resources Ltd. has declared Force Majeure on its Midia and Pelican Blocks in the Black Sea after the Company has been unable to undertake Petroleum operations for reasons outside of its control. In early 2011, after extensive and lengthy efforts, the Company finally obtained from the relevant Governmental authorities the environmental and drilling permits necessary for operations on the Midia and Pelican Blocks. The National Agency of Mineral Resources (“NAMR”) has given approval to a 2011 work program based on which Sterling is obligated to undertake certain offshore activities which include the drilling of 2 offshore wells, acquiring 1,050 linear kilometers of 2D seismic and undertaking investigations and studies to bring the Ana and Doina discoveries forward for development. However, in July 2009 the Romanian Parliament passed a law requiring construction permits for certain offshore activities. Sterling has sought clarification of this requirement from relevant authorities, as the activities contemplated under the 2011 work program clearly appear to have aspects that will require a construction permit. It is Sterling’s view that, after having received responses from certain relevant governmental authorities, that the authorities are currently unable or unwilling to provide construction permits for offshore oil and gas activities. The effect of this situation, which the Company views as political in nature, is to render it impossible for the Company to undertake Petroleum Operations at the present time. Sterling has thus issued a notice to NAMR, stating that the total lack of clarity on the applicable procedure and authority for issuance of construction permits constitutes an event of Force Majeure under the Concession Agreement. Under the terms of the Concession Agreement NAMR must, within 15 days of this notification, either agree with the invocation of Force Majeure, the effect of which would be to extend the duration of the Concession Agreement, or reject the Company’s invocation putting the two parties into a dispute resolution procedure which could ultimately be decided in international arbitration. Sterling Resources Ltd. is a Canadian-listed international oil and gas company headquartered in Calgary, Alberta with assets in the United Kingdom, Romania, France and the Netherlands. The shares are listed and posted for trading on the TSX Venture Exchange under the symbol “SLG”.